It may have spawned one of the biggest controversies in Coeur d'Alene's recent memory, but McEuen Field is now on its way to big changes. Ground has been broken, trees have been uprooted. 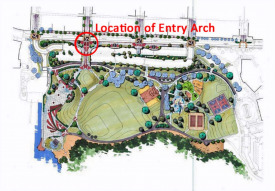 Now, the Coeur d'Alene Arts Commission is looking for artists to help design the entryway arch that will welcome people into the new park. There is no theme, but we're guessing they don't want anything with the word "recall." The city is apparently willing to spend up to $110,000 on the arch, according to its information packet for artists. Applications are due May 24.